Nollywood news + Naija Gist | Yoruba movies, Naijagist, Nigerian music, Naija news, Nigerian movies: Oluwo Of Iwo Chilling with Alaafin of Oyo in Canada. Oluwo Of Iwo Chilling with Alaafin of Oyo in Canada. 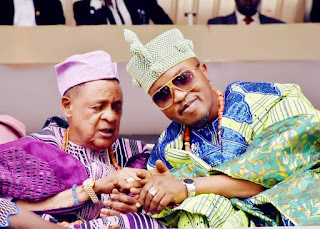 The two Yoruba Monarch, Alaafin of Oyo, Oba Lamidi Olayiwola Adeyemi III and Oluwo of Iwoland, Oba AbdulRasheed Adewale Akanbi were both spotted in Toronto Canada Few weeks ago at a public function.